Uroflowmetry is non-invasive and can be performed multiple times in the same freely moving animal, making it ideal for assessing certain aspects of lower urinary tract (LUT) function in mice. Our uroflowmetry system allows reliable determination of frequency, voided volume, voiding duration, interval times between micturitions, and flow rate during micturition. Additionally, viewing synchronized video corresponding to each void allows characterization of micturition patterns. Techniques used to perform uroflowmetry in mice vary widely across laboratories, and most importantly, open access software to run these tests is not freely available. 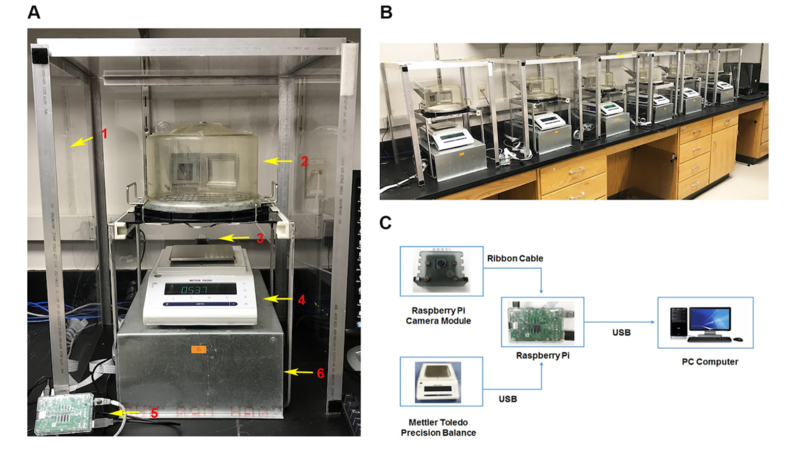 Here, we describe a system that is an open access platform for building and enhancing applications of uroflowmetry technology in mice that is designed to be as accessible as possible. The detailed, easy-to-follow assembly instructions are intended to allow interested researchers without prior knowledge of uroflowmetry to make their own units in a cost-effective manner to improve access to this technology, increase reproducibility of results among laboratories, and facilitate standardization of testing procedures. A: Illustration of uroflowmetry unit. 1. Enclosure; 2. Metabolic cage; 3. Raspberry Pi camera module; 4. Mettler Toledo precision balance; 5. Raspberry Pi 3 single board computer; 6. Balance stage. B: Overview of 6 uroflowmetry units. C: Diagram of uroflowmetry components. A Raspberry Pi camera module and a Mettler Toledo precision balance are connected to Raspberry Pi processor using customized software. Data collected by Raspberry Pi processors are transmitted simultaneously to a desktop computer for downloading and subsequent analysis.